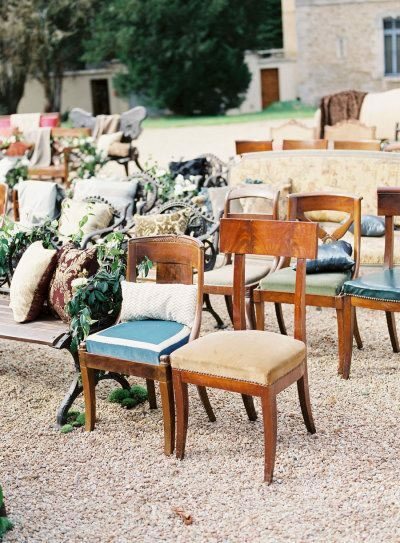 Folding chairs can be tough to sit on; the best way to make your guests comfortable is to provide them with seating pillows not only are they comfortable but they also make for colorful decorations. 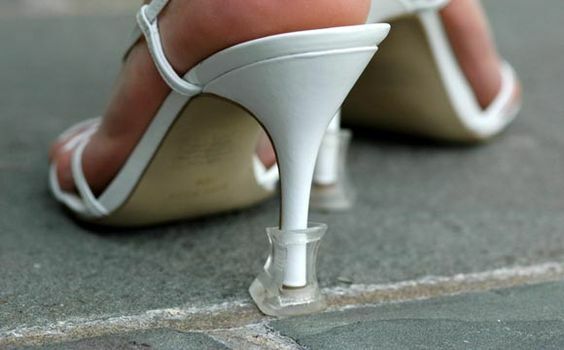 Heel covers are great for walking through grass without sinking, you and your guests don’t want to have green heels do you? Put down stone blocks for your bridesmaids to stand on during the ceremony this way their heels won’t sink into the grass. Hot day? No problem! 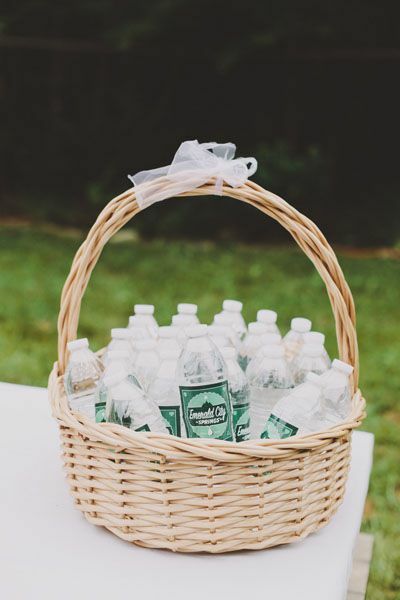 Offer personalized water bottles throughout the venue for ice cold hydration. 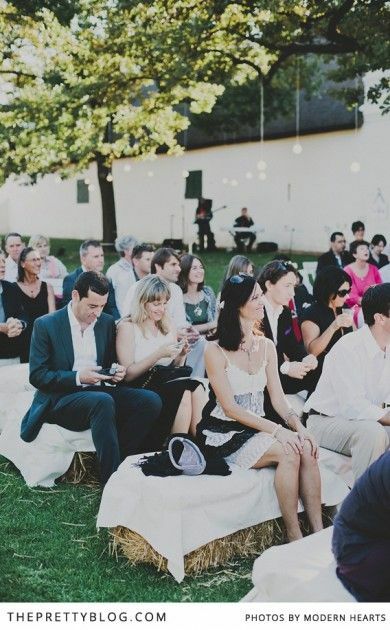 Keep the bugs away, offer individual insect repellent options this is a great favor to customize for your big day. 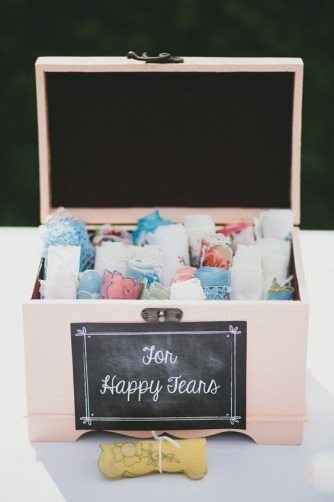 Sunglasses and customized wedding cozies are great reception wedding favors. 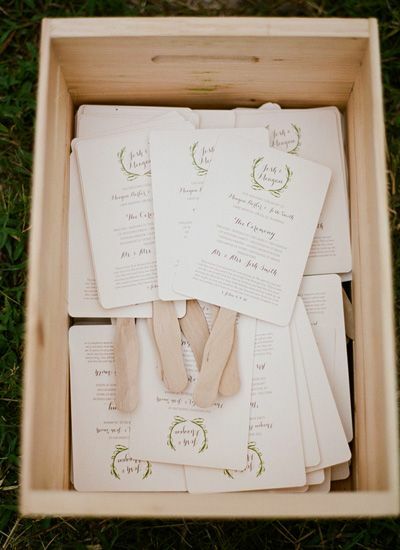 Fan your friends with DIY wedding program fans, this is a creative way to be a little cost efficient. 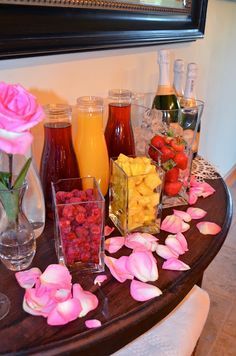 Your bridesmaids don’t have time to snack and hydrate while getting ready. Make sure to take a few minutes throughout the chaos of getting ready to snack and drink water, you don’t want anyone fainting on your day now do you? 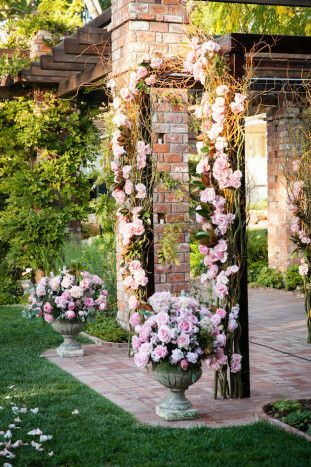 Flower tip; if it is really hot out make sure to mist the flowers to keep them cool. 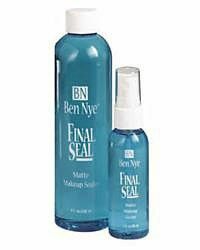 Don’t sweat you makeup off use Ben Nye Final Seal to protect your makeup, costume and theoretical makeup artists swear by it! 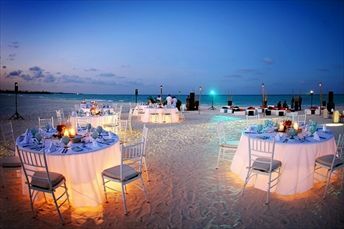 Barefoot dancing is so last season; supply your guests with a pair of colorful flip-flops for dancing. Going for that rustic look? Here is a cute idea; Instead of chairs put some bright colored blankets and quilts over bales of hay. 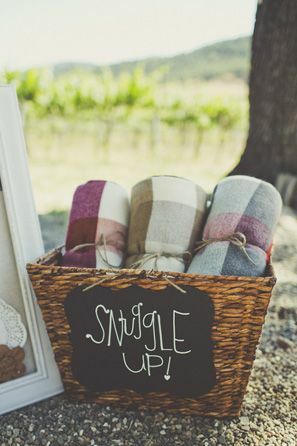 If you know it will be chilly or breezy during your outdoor ceremony have a complementary blanket basket so that your guests can stay warm and enjoy this special moment with you. 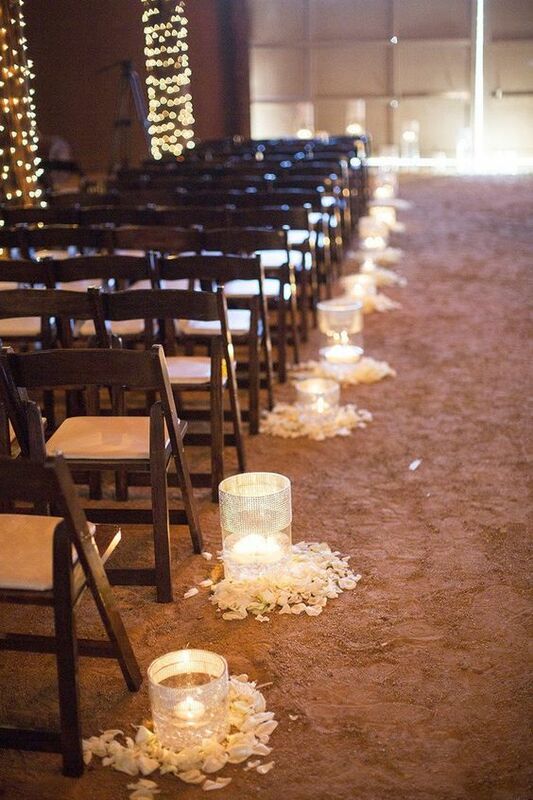 Create a simple yet elegant aisle with flowers and decorative lights. 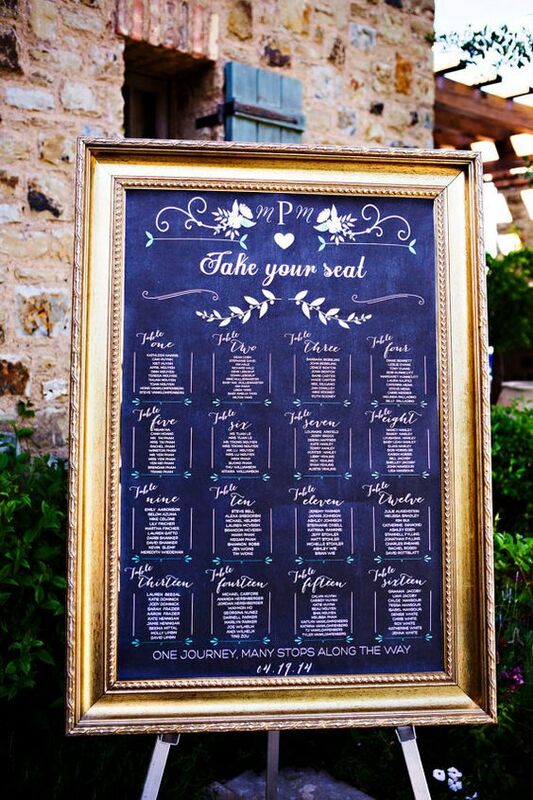 A cool and different way to list your seating chart is to write it on chalkboard paint picture frames. Need some extra lighting? Place camping lanterns underneath the table cloths for a nice evening glow. 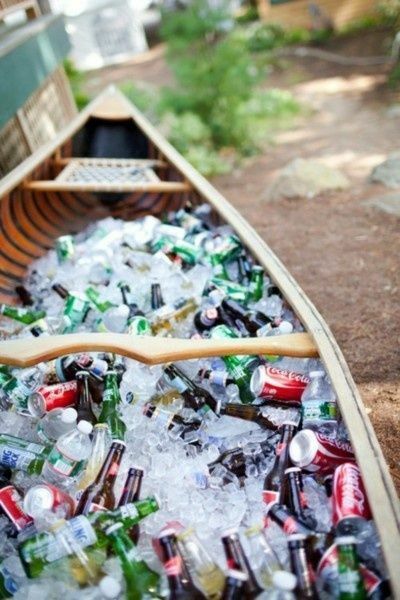 DIY drink coolers; use a flower box or a Canoe like the picture below and put all your beverages in it, it gives it a nice rustic touch to your rustic chic wedding. 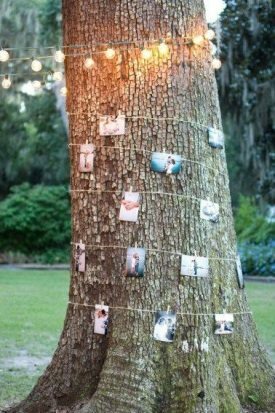 There are two ways you can create a Memories Tree. The first thing to do is wrap a tree or two with string lights and hang photographs. Now you can either hang pictures that you already have or you can leave Polaroid cameras on the reception tables and your guests can take pictures and hang them. 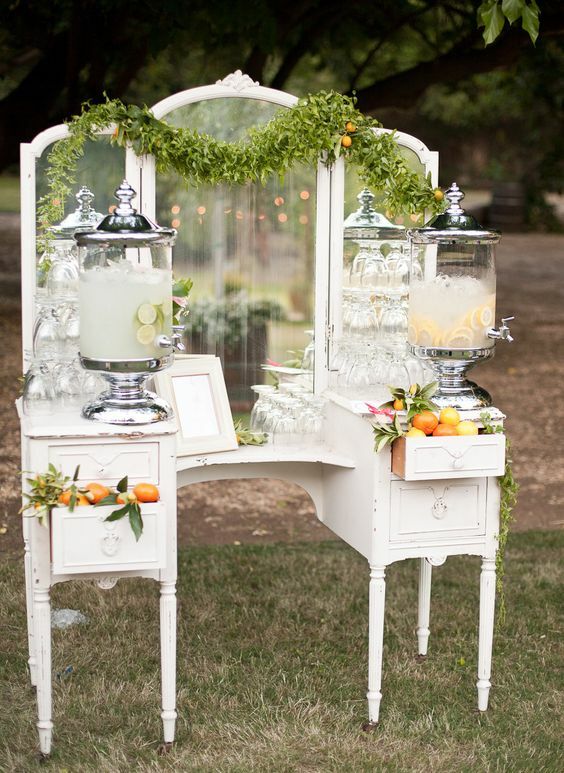 This is ingenious; refashion an old thrift store dresser into a dessert or specialty drinks table. 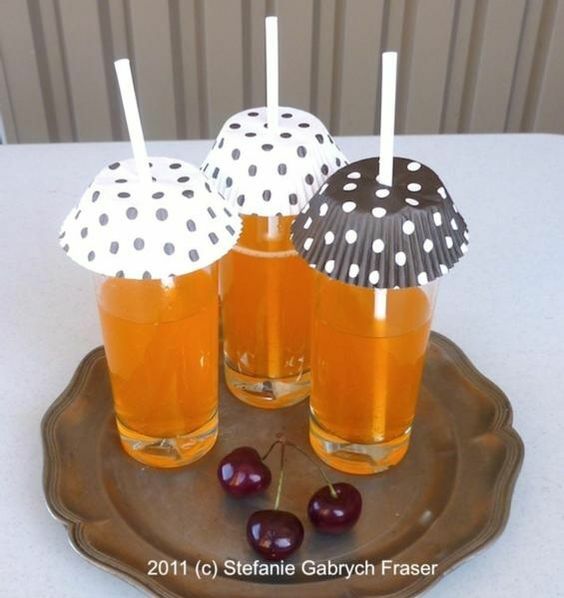 Don’t let the bugs get in your guests drinks, use cute cupcake wrappers and drink covers to keep out of your guest’s drinks. 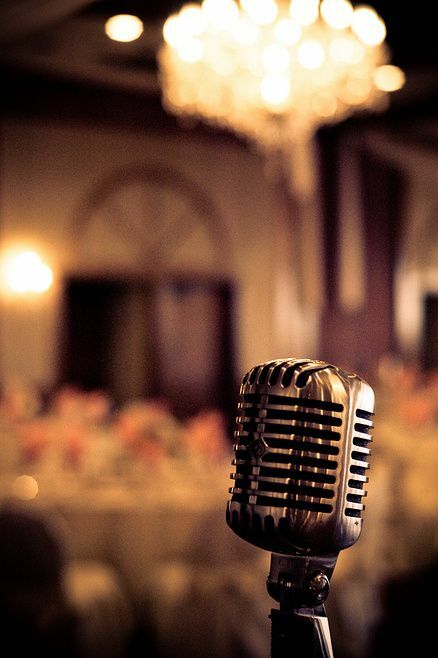 The most important tip off all; DO NOT forget the microphones they are essential for any outdoor wedding and most indoor weddings.